Our Break A Plate game is the real wood game found in carnivals and fairs around the world. This Break A Plate game can hold up to 20 plates at a time and comes with 3 balls to break the plates. This game can sit on the ground, be put on a table or inside one of our carnival booths. Plates are sold separately in packs of 100 for $49.00. 100 plates will last about 45 minutes during heavy play so be sure to order enough plates to break. Our Break A Plate game takes special plates designed for this game so regular plastic plates will not work. Our plates are special plastic plates that are designed to break and crack upon impact. These are not glass plates. 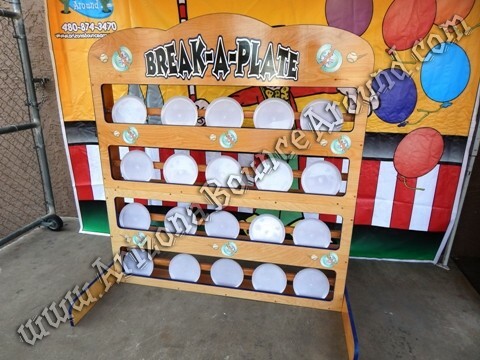 This Break a Plate carnival game is amazing and will have a huge line at any carnival or event. Just be sure to order enough plates to break. This carnival game can get a bit messy but well worth it so order a break a plate carnival game today.